Nothing compares to the feeling of sitting at school on a dreary Monday morning and having your vice-principal inform you that school is cancelled for the rest of the day, as well as Tuesday and Wednesday, and possibly longer. Excitement immediately ensues with the endless possibilities that await the next few days—until the realization hits, the reason for cancelling school[i] is the permanent haze of smog that envelops your city during Indonesian dry season from June to October, also known as musim kemarau. This means activities such as running, swimming, or just walking to the grocery store will involve inhaling much more smoke than one would like. You can only enjoy the gorgeous nature around your city, Palangkaraya in Central Kalimantan, Indonesia, in thick, noxious smog. Palangkaraya is a truly wonderful city populated by remarkable people who are amazing hosts, fantastic cooks, and genial human beings. 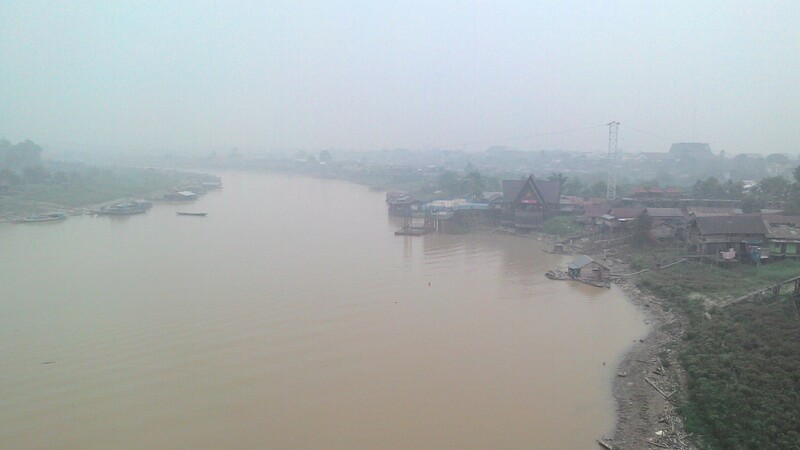 Yet, the omnipresent smog casts a literal and figurative shadow on this lovely Central Kalimantan town. Articles on environmental issues often focus on the plight of animals and abstract[ii] issues such as global warming, but fail to establish a link between peoples’ everyday lives and the impact of unabated pollution. Palangkaraya offers a clear case study where the population suffers greatly and directly from the actions of a few individuals, namely palm oil farmers. In this article, I will explore the root of Palangkaraya’s pollution woes, obstacles to curtailing it, and potential solutions. Unfortunately, this phenomenon is not unique to Central Kalimantan, but is fairly widespread throughout Indonesia as well, which means one has to look at the country as a whole for further context and solutions. U.S. Department of Agriculture (USDA) global crop analyst Michael Shean describes palm oil as “the edible oil of choice, if you will, for much of the world.”[iii] Palm oil is extracted from the fruit of oil palms and is used in a plethora of products such as food, biofuel, and cosmetic products. It is a very popular crop in underdeveloped regions with tropical climates, such as Central Kalimantan, due to the crop’s high yield and the jobs it creates for residents. [iv] According to the USDA, 86 percent of palm oil is produced in Indonesia and Malaysia, an obvious boon for both countries’ economies, but which also has enormous negative implications for these countries’ ecosystems on multiple levels. [v] Palm oil plantations in Indonesia are usually built on rainforest land after workers have burned and destroyed all wildlife there. [vi] These burnings lead to the constant smog that makes life so unpleasant and unhealthy for people living in areas with a large amount of oil palm plantations. Anybody who drives on the highway in Central Kalimantan can see long stretches of desolate wasteland, formerly occupied by luscious rainforests, which look like they came out of a movie about the end of the world. 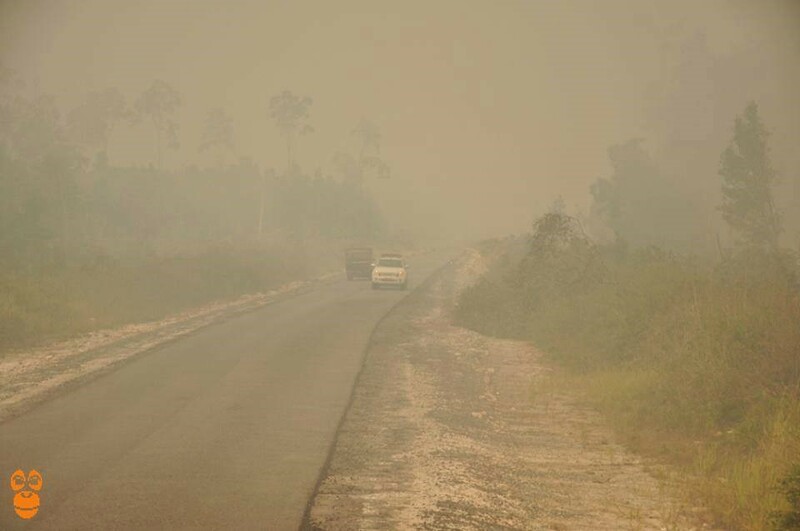 Driving on a smog-filled road in Central Kalimantan. In the 2008 documentary The Burning Season, environmentalist Patrick Anderson bemoans that “using fire to clear forests is illegal [in Indonesia], but the legal system doesn’t work here.”[vii] Furthermore, Transparency International’s ranked Indonesia 114th out of 175 nations in the world on its 2013 Corruption Perceptions Index. [viii] In this author’s experience, most Indonesians accept corruption as a way of life whether they are haggling with a cop to avoid a traffic ticket, receiving a package that was looted by customs officials, or discussing their local government officials. Given this mindset, many people in Indonesia accept and expect that palm oil plantations will break the law. Unfortunately, the repercussions of this acceptance of corruption leads to unhealthy and unsustainable harvesting techniques. For example, Central Kalimantan lost an average of 1.3 percent of its forests each year from 2000-2010. [ix] The rate of deforestation continues to increase, as demand for palm oil continues to rise. Furthermore, any increase in the quality of life of the palm oil workers due to more employment opportunities and higher wages is offset by the health risks and general unpleasantness created by these plantations. Ironically enough, the oversized role that palm oil plays in our lives is at least partially due to health food advocates’ battle to do away with trans fats[xi] and the use of palm oil in biofuel as an alternative to fossil fuels. [xii] So, the most prescient lessons we can learn from these experiences is that activists should be careful about what they wish for. 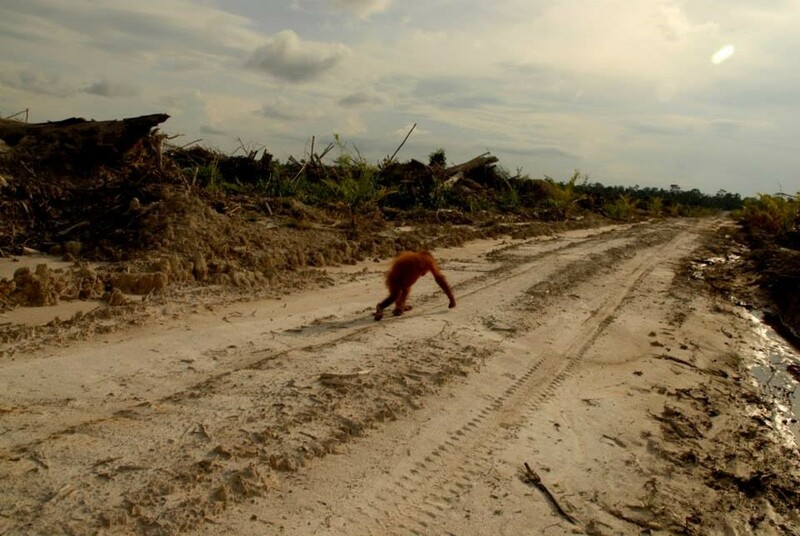 The aftereffects of palm oil plantations. As consumers it is important that we do everything in our power to limit our intake of palm oil and if we do use them we should make informed decisions. Many of the industry’s leaders, such as Wilmar International, Golden Agri-Resources, among others have pledged to end deforestation. [xiii] These companies, which control 60 percent of the global palm oil represent a promising new trend, but a lot of work remains. [xiv] The remaining 40 percent of palm oil producers have not made any such commitment, which is especially alarming because many of the worst offenders tend to be small farms. These small farms tend to go unchecked as they have no incentive to reform their practices unless their owners are threatened with serious consequences. [xv] Thus, if Indonesia, specifically Central Kalimantan, wishes to solve this crisis, local governments need to provide feasible solutions. An example of this can be seen in Central Kalimantan’s new palm oil monitoring system. This system tracks individual plantation productivity, deforestation, and other key statistics in an effort to identify and punish companies that break the law. [xvi] The program is wonderful in theory, but the local government has to ensure that it works. Unfortunately, the sad truth is that Indonesian[xvii] authorities will not catch most people flouting its environmental laws, and without a serious deterrent, people and companies will continue to ignore these rules. Despite general skepticism in Indonesia about government officials’ willpower to enforce laws, there are numerous cases where local officials do the right thing. For example, Sudirman Djajaleksana, a member of local government bureaucracy in Balikpapan, East Kalimantan uses the story of fining a local business owner Rp. 5 million[xviii] for cutting down a tree planted by conservationists that he found annoying to illustrate how Balikpapan is battling lawbreakers. [xix] While it is impossible to quantify the impact of such a story on a local community, the actual arrest and punishment of a local criminal serves as a deterrent. If authorities in Central Kalimantan are able to catch and severely punish illegal polluters then the region has a real chance of reducing air pollution and deforestation. A smoggy day in Palangkaraya. Even if one does not believe in global warming or have any compassion for the wildlife being destroyed by palm oil plantations, one has to empathize with the people in Central Kalimantan, as their quality of life constantly suffers. Furthermore, this practice is wholly unsustainable and any short-term financial incentives should be weighed against the negative short and long-term effects of uncontrolled palm oil plantation growth. The last few days have brought much-needed rain to Palangkaraya, which means that the rainy season, or musim hujan, has finally arrived. The town’s residents will have a short respite from the constant smog that dominates the dry season; however the smog will return every year until all the forests in Central Kalimantan are cut down or more effective steps are taken to curtail palm oil plantations, whichever comes first. [i] For the last three weeks we missed at least two days of school each week due to excessive smog. According to my fellow teachers at SMAN 2 in Palangkaraya, this is not a rare occurrence and during one recent dry season two consecutive weeks of class were cancelled. [ii] I use abstract because the short-term effects of global warming are not significant enough to cause people to make serious adjustments to their lifestyles. [iii] Ben Block, “Global Palm Oil Demand Fueling Deforestation,” Worldwatch Institute, http://www.worldwatch.org/node/6059, accessed 19 October 2014. [v] Sharon Chen, et al, “Haze Return Amid Drought Stokes Concern of Repeat Choking,” Bloomberg, http://www.bloomberg.com/news/2014-03-05/haze-return-amid-drought-sparks-calls-for-action.html, accessed 19 October 2014. [vi] Dana MacLean, “Palm Oil Fuels Indonesian Deforestation,” Al Jazeera, http://www.aljazeera.com/indepth/features/2014/04/palm-oil-fuels-indonesia-deforestation-indigenous-displa-201443145636809366.html, accessed 19 October 2014. [vii] Cathy Henkel, The Burning Season, DVD, directed by Cathy Henkel (2008; Washington D.C.: National Geographic International, 2009), DVD. [viii] Transparency International, “Corruption Perceptions Index 2013,” Transparency International, http://www.transparency.org/cpi2013/results, accessed 19 October 2014. [x] Carl Zimmer, “Looking at Oil Palm’s Genome for Keys to Productivity,” New York Times, http://www.nytimes.com/2013/07/24/science/looking-at-oil-palms-genome-for-keys-to-productivity.html, accessed 19 October 2014. [xi] Allison Aubrey, “Palm Oil in the Food Supply: What You Should Know,” National Public Radio, http://www.npr.org/blogs/thesalt/2013/07/25/205486197/palm-oil-in-the-food-supply-what-you-should-know, accessed 19 October 2014. [xii] Huileng Tan, “Asian Biofuel Motorists Drive Palm-Oil Prices Higher,” Wall Street Journal, http://online.wsj.com/articles/asian-biofuel-motorists-drive-palm-oil-prices-higher-1401354565, accessed 19 October 2014. [xiii] Laurel Neme, “Endangered Orangutans Gain From Eco-Friendly Shifts in Palm Oil Market,” National Geographic, http://news.nationalgeographic.com/news/2014/10/141009-orangutans-palm-oil-malaysia-indonesia-tigers-rhinos/, accessed 19 October 2014. [xvii] Or authorities anywhere for that matter. [xviii] This is about ten percent of the average Indonesian’s yearly salary, so a very substantial amount. [xix] “The Many Faces of Illegal Logging in Kalimantan,” The Jakarta Globe, http://thejakartaglobe.beritasatu.com/news/the-many-faces-of-illegal-logging-2/, accessed 20 October 2014. October 25, 2014 in News.